"An engaging and informative view into the Nagas world and beautifully detailed and vivid descriptions about the land to which they have so effectively adapted. A greatly satisfying read for anyone interested in learning about unique and fascinating cultures and their authentic, innovative adaptations to living in challenging natural environments. Not to be missed!" The Columbia Review. 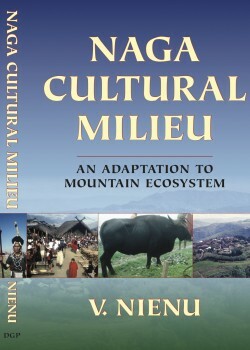 “Naga Cultural Milieu: An Adaptation to Mountain Ecosystem” by V. Nienu is a non-fiction book about a group of ethnically related tribes, collectively known as “Nagas”, who have successfully developed adaptive mechanisms living in the steep mountainous terrains spread from the northeast of India to the northwest of Burma and southwest of China. It offers a comprehensive history of the Nagas peoples, from their origins to pre-British colonization, along with some commentary on their present and future. The culture of the Nagas tribes has remained relatively untouched for a very long time, as a result of access barriers due to the tribes’ remote locations. However, the tribes have been significantly impacted by colonization, political instabilities, and assimilation and acculturation. In “Naga Cultural Milieu: An Adaptation to Mountain Ecosystem”, Nienu provides an engaging and informative view into the Nagas world and beautifully detailed and vivid descriptions about the land to which they have so effectively adapted. A greatly satisfying read for anyone interested in learning about unique and fascinating cultures and their authentic, innovative adaptations to living in challenging natural environments. Not to be missed!